The history of the Grammer Guitar is a classic American tale - a story of the great traditions in the fine art of luthiery. A story of artists, colorful personalities, and the highs and lows they encountered along the way. 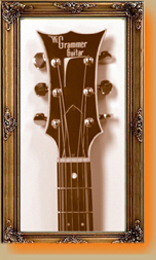 It is also the story of a true commitment to quality craftsmanship, great value and great playing flat top guitars. 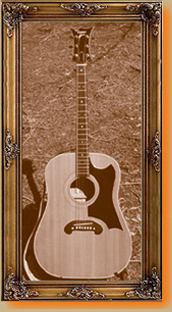 The Grammer guitar celebrated its fortieth birthday in the year 2005. After all these years, this classic guitar has become quite a collector's item. A rare piece of americana that came out of the 60's, and is still being played by guitarists in the new millenium. In the early 1960s, Billy Grammer, a hard-working musician, great singer, gifted guitarist and good businessman, was finding success and keeping very busy. He had a big hit record that crossed genres, a membership in the famous Grand Ole Opry, was making radio and television appearances, led sessions in the studio backing other singers, and was gearing up to record his next album. 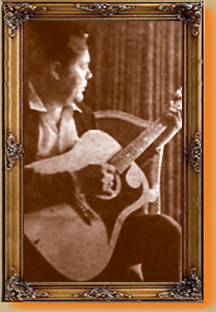 Ever since starting his career as a professional musician, Billy envisioned building the perfect flat top guitar. It would be built to his specifications, combine all the best features of his favorite acoustic guitars, and be made out of the finest materials available. He had made many connections in the music business and felt the time was right to build the Grammer guitar. Billy grew up the eldest son in a musical family and started playing guitar at an early age. As a young man, he served in the Army during World War II, and upon discharge, worked as an apprentice toolmaker at the Washington Naval gun factory at Shop #20. The skills and disciplines he learned would serve him well when he started his own business making guitars. Billy's high school sweetheart, Ruth Burzynski, also worked in DC for the government, and the two married in 1944. Shortly after the end of WWII, 18,000 of a 24,000 work force were terminated from the gun factory. Billy and Ruth returned to their home country of Franklin County, Illinois. Once the couple returned home, Billy received a letter from a friend by the name of Bob Beck who lived in Vienna, Virginia. The letter stated that Connie B. Gay was forming a live radio show at WARL in Arlington, Va. The show was called 'Town and Country Time." Bob thought that if Billy would come and audition as a singer that he would get the job, which he did. This was in 1947 and the groups name was "Radio Ranchmen." Mr. Gay later became the producer of the Jimmy Dean television show that aired from 1955 to 1958 of which Billy was a cast member. Folk and country music were big on the radio in the early 1960s. The airwaves were filled with a plethora of different styles and sounds. Ballads, protest songs, rockabilly and surf instrumentals could be heard coming out of America's radio speakers at any given time. The guitar was at the forefront and the instrument of choice for many. Strumming, picking and singing had become a popular hobby for the masses. High schools had folk music clubs for students as well as stage and jazz bands. Music stores were selling guitars as fast as they could get them in. Even the big department stores were offering guitars in their catalogs. The British invasion started and kids everywhere were forming bands and playing guitar in the basements and garages of America. The 60's guitar boom was on and thriving. In 1964, Billy went to visit his fishing buddy, Clyde Reid. Clyde operated a music store in Donelson, Tennessee, right outside of Nashville. He was lamenting to Billy that he wished he could get a decent flat top guitar for a decent price. "It would seem that you can get a cheap piece of junk for very little money, or pay top dollar for one of the big name guitars," observed Clyde. This conversation convinced Billy to take that great leap forward. The idea for a country and western guitar in the heart of Music City USA was a sound one. Billy was in the music business and all his high-profile guitar buddies would want one of his guitars, and they would play them. The good word would spread about the Grammer guitar. Billy knew he would need the help of an experienced luthier to build his flat top guitar. He contacted J.W. Gower, a Nashville resident who came from a family of luthiers and wood workers. The Gowers had been constructing acoustic guitars out of their garage since the mid-1950's. Jay Gower also operated a home recording studio where you could cut a demo. Billy, Clyde and J.W. joined forces and formed a partnership. With Billy at the helm, Clyde with his managerial skills, and J.W. with his guitar-building know-how, all the pieces were in place. They approached a Nashville lawyer named General Howard Butler and under his legal representation, established a corporation. The new company would be called RG&G Musical Instruments, Inc. (Reid, Grammer, and Gower). Billy was always good with his finances, and with an $18,000 investment (a shoestring budget), RG&G got down to the business of building a guitar to Billy's specifications. 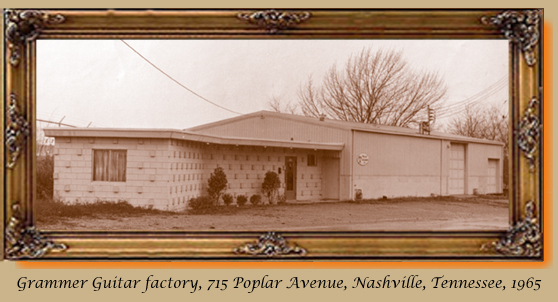 Warehouse space was located and the factory was set up at 715 Poplar Avenue in Nashville. Two of Billy's guitars, a Martin D-18, and a Gibson J-45 were dissected, examined, and studied at great length. With the help of Fred Hedges, Billy drafted out the dimensions for the new instrument and came up with a design that was both innovative and handsome. It had what Billy considered to be the best features from both the Martin and the Gibson. A bracing pattern was formulated and after six months of trial and error, the first Grammer prototype was built in March of 1965. J.W. Gower built the prototype and Fred Hedges and Billy then set up the plywood forms, templates and rim liners needed to reproduce the instrument. A portion of the budget went towards drum sanders, a panagraph, power tools, lathes, and other necessary wood working equipment and materials. Other members of the Gower family, Bobby, Jewel, and Alma, also worked at the Grammer factory. Clyde Reid was shop foreman and overseer of daily operations. Production started in the spring of 1965. Billy's dream was finally coming to fruition. Grammer guitars were showing up in music stores in early 65. The guitar was 15 & 1/2 inches wide, 5 inches in depth, and 40 inches total in length. The neck scale was 24 & 1/2 inches (corrected), and was offered in three sizes. During that first year of production, the workers were able to turn out approximately one guitar per day, or five a week. The cost for each guitar was roughly $127.00 and they were sold for $395.00 retail. RG&G never gave away any of their instruments, but occasionally did sell them for cost to some of the big name musicians who would use them on stage. According to Billy, RG&G did make several small scale, or "baby" Grammer guitars. However, the records were destroyed in a fire after Ampeg had purchased the company and the exact number is uncertain. The serial numbers started off at 1001. This was a safeguarding tactic against potential counterfeiting. If a guitar was returned with a serial number lower than 1001, they would know someone was trying to pull a fast one. There were no model numbers for the original RG&G guitars. There is a space on the original labels for a model number, but none was ever assigned. No records exist to tell you what year your RG&G guitar was made, but it's fairly easy to make an educated guess. It is estimated that approximately 1000 guitars were produced by the Grammer factory from 1965 through 1968 (the highest serial number I have seen is #1991). These guitars are true handcrafted gems and are some of the best flat top guitars ever produced. The very first Grammer (#1001) was given to the Country Music Hall of Fame and is on display for all to see. The first 70 Grammers (approximately) employed a mustache style bridge. The headstocks on the first production models were wider at the base - a bit more flanged and exaggerated. Sometime after the 20th guitar was assembled, the decision was made to redesign the bridge, pickguard, and headstock. The later models featured a crown style bridge. The crown bridge completed and complimented the overall design and look of the guitar. This majestic crown shape matched the top of the headstock. On later models, accenting these features -- a triangular insert of dark wood at the base of the body. Everything was done in-house including the head stock veneer. The only elements that were outsourced were the deluxe hard shell leatherette cases, the Grover tuners, and Grammer guitar strings specifically made for Billy by Bud and Mae Halcomb of GHS, Battle Creek, Michigan. There were many features that were standard on the Grammer that you didn't see on the competition. A unique inlay runs the length of the fingerboard between the E and B and between the A and E strings. This inlay matches the body binding on the guitar. At no time did RG&G put binding on the neck. All binding and fingerboard inlays came from a company in California by the name of Vitali, and each guitar may have a slightly different binding and matching inlay. Oversized pearl dot inlays are set on the first fret, alternating with smaller double dot inlays, and three small dot inlays at the twelfth fret. There are large pearl dot inlays on the crown bridge also. Strap knobs on the base of the neck came standard. If this wasn't enough, the guitar had a lifetime guarantee against defects in materials and workmanship. The finest tonewoods were offered: tightly grained Sitka spruce for the sound board; Backs and sides were offered in Brazilian rosewood, flamed hard maple, or ribbon mahogany; Fret boards were made with the finest ebony and rosewood. All the finishing products came from Guardsman Chemical in Grand Rapids, Michigan. RG&G was not afraid to push stylistic boundaries and offered progressive finishes such as red, purple (wine), and blue bursts, and the famous green burst that was so desirable. The green burst was one of those brilliant mistakes. Some of the blue finish was still in the paint gun when the painter went to do a yellow sunburst finish. A Grammer with a green burst finish is one of the most sought after and collectible. The first Grammers came standard with Grover tuners. Grovers were the best tuners available in the early 60's. Billy became unhappy with the quality of the chrome finish on the Grover tuners and became aware of Schaller keys made in Germany. He was impressed with their machine heads and started using them. Later, the Grover Company brought their quality level up and Grammer guitars used both Grover and Schaller tuners. 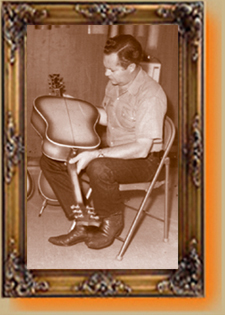 RG&G presented the Grammer guitar to the public at the 15th annual Country Music Festival in 1966. The festival was also known as the DJ Convention, and was held at the Andrew Jackson Hotel in downtown Nashville. RG&G rented room 402 and lots of Opry stars showed up to celebrate the unveiling. Leon Rhodes, Merle Travis, and Hank Locklin, three guitar luminaries came by to show their support. There were custom made Grammer guitars for the public to see and play. Many of Billy's Opry cohorts wanted one of his flat tops. They were striking visually, easy to play, and had a fantastic tonal quality. They were a Nashville grass roots instrument made in the country music capital of the world! Visiting and touring guitarists could stop by the factory, take a tour and see the instruments being made first hand. The list of stars that played the Grammer was very impressive. The joke going around was that the top country stars owned equity in the company. Red Sovine bought three, a red burst, a blue burst and a green burst. Red would change outfits during his performances to compliment each of his Grammers - not to mention his red hair. Leon Rhodes, one of the hottest pickers going, also played a Grammer, and worked at the factory as a quality control inspector/final assembler. Faron Young's lead guitarist Odell Martin, as well as many others, were instrumental in quality control. The good times have a way of coming and going and RG&G began experiencing financial difficulties during the final months of 1967. Closed corporation stocks were sold to help with some of the financing. Even with the financial help of Fred Moore and other outside investors, the company still wasn't seeing the kind of revenues it would have liked. In spite of this, RG&G was able to stay in the black. One reason for the financial trouble was the production costs of such a high quality instrument. The exacting detail and standards that were adopted from the beginning were never abandoned and were now eating into the company's profits. There was also unrest within the founding members of the corporation. J.W. Gower became disillusioned because he wanted to build the Gower guitar. General Howard Butler, the corporation attorney, recommended that he dissolve his part in the company and go his own way. A few weeks later, J.W. started his own company. Clyde Reid also left after a dispute concerning guitars being rushed to market before the finish had set up properly. It was difficult for Billy to see his old friends go, but this was a business first and foremost. The original RG&G partnership was now totally dissolved. Billy was on the road much of the time and wasn't able to stay on top of things at the factory like he would have wanted. He still maintained an active profile when his schedule allowed. It was, after all, his company and he wasn't about to give it up without a fight. In the early months of 1968, Billy was approached by Little Roy Wiggins, a friend and fellow Opry member. Roy was the steel guitarist in Eddy Arnold's band and had recently been hired by Unimusic, who had just purchased the Ampeg Company. Roy got in touch with Billy and told him that Ampeg was interested in purchasing the rights to produce the Grammer guitar. Ampeg had an interest in Emmons steel guitars as well and wanted to add the Grammer guitar to their growing roster of instruments. Billy was looking for another source of income to help keep his guitar company afloat, and agreed to meet with the Ampeg brass. Ampeg paid for Billy's trip to their Linden, New Jersey headquarters. There he met with Al Dauray and Ray Mucci and the two sides came to an agreement. Ampeg would get the rights to produce the Grammer guitar, and Billy would receive a 5% royalty for each guitar sold. The Ampeg Company would own and operate the Grammer factory and bring in their own management to oversee operations. Unimusic/Ampeg aggressively went after the country music market. They located their music stores where the music was being made and a regional sales office was established in Nashville. The Nashville Showroom, also known as Little Roy Wiggins' Music City, was located at 427 Broadway a few doors down from Ernest Tubb's record shop, right across the street from Tootsie's Orchid Lounge and the Ryman Auditorium. Roy Wiggins was the head of the Nashville location and the store featured all the Ampeg product line, including the Grammer guitar. 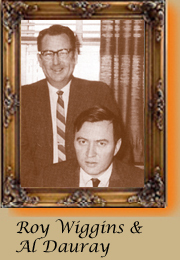 Bob Browning worked as store manager and Jack Stoner was the repairman. On Fridays and Saturdays when folks would come to town in great numbers to attend the Opry, Little Roy and his co-workers would put on afternoon concerts at the Showroom to entertain them. Bill Monroe came into the Showroom one fateful day and put on one great impromptu show. Coincidentally, Bill Monroe's lead singer at the time, Joe Stuart, played a Grammer! Ampeg's plans were to take the Grammer to the rest of the guitar-buying public across the nation. Regional Sales offices were set up in the midwest at 10924 South Western Avenue in Chicago, and out west in Los Angeles at 6229 Sunset Boulevard. Uncle Dave Sturgill (aka the Banjo Man) was given the title of president and was brought in to run the daily operations at the factory in Nashville. Billy and Dave were hunting and fishing buddies, and Dave was a good choice for the position. Uncle Dave was a fine craftsman and luthier. He and his sons built their own line of instruments in Piney Creek, North Carolina, and Dave's son Johnny worked as a painter finisher with his dad. The Grammer factory was about 3 & 1/2 miles away from the Showroom. It took about ten minutes to get from one place to the other if you took Murfreesboro Road. New instruments could go from the factory to the Showroom in practically no time at all. During this interim phase, The fruits of Ampeg's investment in the company were now evident. Ampeg was now allocating funds and there was money made available for supplies. RG&G was able to keep up their production schedule and Grammers continued coming out of 715 Poplar Avenue. One example of how things were changing can be seen in a guitar that was made during this transitional period. RG&G # 1991 has the Ampeg "a" logo/small g "grammer" logo on the headstock while the RG&G label appears inside the sound hole. This possibly could have been one of the guitars that was returned to the factory and repaired under the lifetime warranty. Faulty guitars were returned and the original owner had the choice of getting their Grammer repaired or replaced with a new one. These returned guitars were refurbished and were sold to the public again. Another possibility - It also could have been an RG&G body that was assembled with a newer Ampeg neck. 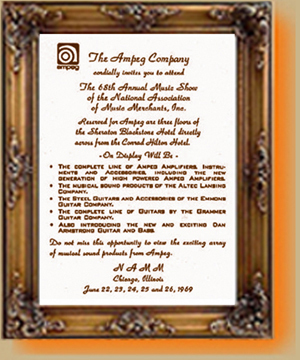 In April of 1968 after Ampeg took over the company, a fire consumed the Poplar Avenue facility. Within a matter of minutes, everything was destroyed. The cause was written down as spontaneous combustion and was blamed on rosewood leavings in a barrel that somehow ignited. Billy had intended that next day to go to the factory to secure sales records and original drawings. After the investigation was completed, Ampeg built a new facility and changed the address to 700 Poplar Avenue. Hardly anything was salvageable after the fire. Many of the tools and materials had to be repurchased. The new factory was rebuilt, restocked, and opened for business... a tremendous and expensive undertaking to say the least. The new factory was set up for a more modern, mass production approach compared to what RG&G had been doing. 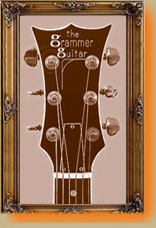 Later, the new Grammer Guitar, Inc., now owned and operated by Ampeg, was once again producing the Grammer Guitar. Billy had high hopes that things would stay the same at the factory, but Ampeg had different plans. RG&G had always stuck to the basics and put all their efforts into one instrument. But this was the decadent 60's and Ampeg expanded the Grammer guitar line. They now offered five models with the Model G being the flagship model identical to the RG&G dreadnought. It was 15 & 1/2 inches wide with a slightly smaller 19 & 3/4 inch body, and available in rosewood or maple with an alpine spruce top, or in mahogany with a Sitka spruce top. The G model came in several variations, the G10, 20, 20-C (custom), 30 & 40. The options were different woods and peg head veneers. The G10, G-20C, and G40 were the high-end models. The G-58 model designation appeared after the Ampeg Grammer guitar catalog was published. Grammer Guitar, Inc. also offered the S, R, T and B Models. The Model S was slightly smaller with a 14 & 3/4 inch body and was aimed at the student and female market. The G and S models were also offered with select woods and customized adornments. In the Exotic Custom Series, you could have your name inlayed on the fret board or get an even fancier pick guard with your choice of colorful finishes and gold hardware. The Model R was a 12 string with a G body that had a slim profile neck and was touted as "easy to play." The Model T was a tenor guitar -- something that most of the other companies didn't bother with. It had a full-scale neck and a small 13 & 1/4 inch body. The Model B was a baby guitar, and had a 22 inch short-scale neck, and the small body size. Bringing the tenor and baby models back was a nice nod to guitar making traditions. Ampeg also sought out the big country music stars of the day. The celebrity giveaway program was a great way for the company to take advantage of free advertising and media exposure. The Grammer really stood out, and if you watched any of the country music shows on television back in the late 60's, you would see Porter Wagoner, Dolly Parton, and many of the Hee Haw gang playing a Grammer guitar. Even Mick Taylor of the Rolling Stones had one! Webb Pierce had a maple blue burst with his name inlayed on the fret board. Roy Acuff, Lester Flatt, Loretta Lynn, Ernest Tubb, the list reads on and on. All the brightest Country Music stars were playing the Grammer guitar. The Grammer guitar had its NAMM show debut at the 69 show in Chicago. Grammer Guitar, Inc. was making a splash in the guitar market. Along with the models mentioned above, they also offered celebrity model guitars. The Johnny Cash model had a unique gray burst finish with a rounded pick guard that complimented the Man in Black's normal stage attire. The Cash moniker adorned the headstock. The one owned by Johnny was sold at his Sotheby's estate auction for $131,000. There was also the Merle Haggard model. This was a more traditional instrument with the Hag's moniker on a slotted headstock. It had an OM style body, and an ebony bridge and fingerboard. There were several variations between the RG&G Musical Instruments, Inc. guitars and the Grammer Guitar, Inc. guitars. Most notably was the decision to change the head stock logo from an initial capital letter to all lower case. All the Ampeg guitars have the lower case "g" (grammer) as opposed to the upper case "G" (Grammer) on the originals. At some point in 1968, Ampeg adopted the small "a" or helmet head logo. The first guitars produced under the Ampeg regime had this logo. The label inside the sound hole is the best way to differentiate between the two. The word "GUARANTEED" is on the top of the RG&G moniker in the center of the label which is a light blueish silver label with blue letters. The Ampeg instruments have a large white lower case "g" against a dark background on the left hand side of the label. The model and serial numbers are on the right hand side. History was once again repeating itself and Grammer Guitar, Inc. was having financial problems. The huge costs of rebuilding and refurbishing the factory coupled with early production difficulties kept earnings hovering too close to the bottom line. In the rush to go to market, many of the instruments were sold before they should have been. The lifetime guarantee enabled customers to return their guitar and receive a new one. Many of the guitars that were returned with cracks and splits were salvaged and resold, but this hurt the guitar's good reputation. The expenses, once again, more than outweighed the earnings. The music industry was going through some tough times too. All the big name guitar companies like Fender (sold to CBS), Gibson (sold to Norlin), Gretsch (sold to Baldwin), and even Ampeg were sold to other organizations. Small independent music companies were becoming a thing of the past. As more new companies emerged into the market, it became over-saturated. The industry took a downward turn and so did the economy. Other newer companies like Kaman, who produced Ovation guitars with a technologically advanced pickup system, had become the latest and greatest thing. Peavey was also doing all right for themselves with their line of guitars and amps. Musicians were trading in their tube amps for solid-state models. The times and tastes of musicians were changing. Ampeg, under the Unimusic regime, was experiencing all the same problems as the rest of the industry. In spite of the fact that they had just developed the SVT bass amp, they still couldn't turn things around financially. Something had to give, and Grammer Guitar, Inc. became the first of many cutbacks. It was nothing personal, just a business decision. Ampeg was always first and foremost a company that made amplifiers. It was a logical decision to go after the electric guitar market to aid sales of their amplifiers. Unimusic/Ampeg was eventually sold to Magnavox/Selmer in 1971. Where did this leave the Grammer Guitar? Ampeg produced the instrument from late 1968 through 1971 before it lost interest in the acoustic guitar market. It also ended its agreement with Emmons steel guitars. Ampeg was now concentrating on their line of electric guitars and amplifiers, delving further into rock & roll. Ampeg under Magnavox/Selmer had little or no interest in country music. The Nashville Showroom was still up and running with Roy Wiggins at the helm. Grammer Guitar, Inc. now found itself in the hands of Ralph Fielding. Ralph inherited the Grammer Company from Ampeg on a promissory note, so no money ever changed hands. Ampeg wanted to end their involvement and move forward. With Ralph Fielding as the Chairman, the factory at 700 Poplar continued to build the Grammer guitar. Things moved along fine for a while. Grammers were coming off the assembly line as the new decade unfolded. The Ampeg helmet head logo was now gone but the lower case "grammer" still remained. One interesting side project that came out in April of 1971 was a promotional album called "Martin Plays Grammer" featuring O'Dell Martin playing the Grammer guitar. O'Dell was one of those musicians that worked at the Grammer factory, and he could pick a mean guitar. The story goes that right before heading to the studio after a hard days work, O'Dell picked up one of the returned Grammers that was in the shop and took it with him to record the album. Bob Kujala was assistant manager at this time and worked along side O'Dell and long time employee Gene Martin. One nice thing about the Grammer factory was it hired musicians that were in between jobs and kept them going financially. In early 1972, supplies from the comptroller at Ampeg's New Jersey facility stopped coming to Nashville. Supplies were not being shipped unless they were paid for in advance. Billy no longer had any association other than his name on the headstock. Something wasn't right and all eyes turned to Ralph Fielding. It would seem that money was being diverted for personal use. Grammer Guitar, Inc. was mortgaged and its assets were used as collateral for a new home loan. The loan defaulted and the builder took over the rights to the company. Grammer Guitar, Inc. was now in the possession of a building contractor! The builder that took over the company's assets contacted Roy Wiggins. Roy took over the ailing and wounded company and attempted to revive it once again. By the middle of 1972, operations were at a standstill. Things were in such a sorry state that even Roy Wiggins, with all of his musical know-how and connections, couldn't bring the company back to life. The Grammer Guitar was no longer being produced. The building and machinery and what supplies were left over were put up for public auction. Tut Taylor and his son Mark won the auction and took over the factory. I have no interest or claim against the name Billy Grammer as connected with Grammer Guitars. When I purchased the assets of the Grammer Guitar in the early 1970's at the IRS auction, the name was not part of it. I did not buy the name. I do not have any connection with it. As far as I know, it belongs to Mr. Billy Grammer. So ends the saga of the best darn flat top guitar that was ever made! At this writing, I am still unable to provide any sound information on the Ampeg Grammer Guitar, Inc. serial numbers. St Louis Music inherited all the records when they acquired Ampeg, and they weren't able to provide any information. I have been collecting any and all serial numbers I can find from vintage dealers and eBay auctions with the hopes of figuring out how these numbers were assigned. In the 2 & 1/2 years that Grammer guitars were made under the Ampeg regime, three to four thousand produced sounds about right. Hi Billy - remember me? Rob Kilgore has kept me informed about his research into Grammer guitars that of course, includes his contact with you. His words awaken many memories for me, Billy, and so many people they include are no longer with us - Roy Wiggins, Dave Sturgill, etc. I have many regrets about those days and feel that I failed Grammer and all the people who had so much faith in it. I regret very much that you and I never developed a close relationship - entirely my fault that we didn't! All I can say at this late date is to tell you that I'm sorry and to wish you the very best. We live and learn but generally its too late to do what we should have done in the first place. Your e-mail warmed my heart! Time takes care of a lot of things and it seems that one of the hardest things to do is admit mistakes that we've made. I accept your apology and wish you the best with your health, etc. How old are you? I'll be 80 the 28th of August. I accepted Christ back in 1969 and this has helped me a whole lot. My very best to you.